Paul W. Ogden has dedicated his life to educating young deaf and hard of hearing people and raising awareness of what it means to be deaf in a hearing world. He has taught and mentored a generation of teachers, and his classic volume, The Silent Garden, has served as a guide for parents and educators for over thirty years. Now he tells his personal story of challenges faced and lessons learned, revealing that the critical, guiding factors for him have always been language and successful communication. Born in a time when many deaf children had no access to language, Paul learned spoken and written language skills at a young age through the painstaking efforts of his mother. His tight-knit family, which included one deaf and two hearing older brothers, facilitated open and constant communication using a variety of methods. His father was a pastor who was involved in the civil rights movement. Despite the family’s closeness, his father struggled with depression, an illness that would take the life of one of Paul’s brothers. As a student at a residential deaf school where the use of American Sign Language (ASL) was suppressed, Paul continued to build on the speech and lipreading skills he had learned at home. He returned home for high school and graduated as co-valedictorian—unaware of the standing ovation he received as he walked to the podium. Following a rewarding experience as an undergraduate at Antioch College, Paul went on to earn a PhD from the University of Illinois, a rare accomplishment for a deaf person at that time. During his graduate studies, he finally had the opportunity to learn ASL. As an award-winning professor of Deaf Studies at California State University, Fresno, he successfully petitioned for the university to recognize ASL as a language, and he established the Silent Garden program, which has grown into a flourishing provider of training and resources to support the Deaf community. In My Life of Language, Paul offers eloquent reflections on both the joyful and difficult periods of his life as he navigated relationships, faced discrimination, questioned his faith, and found great happiness in his marriage. 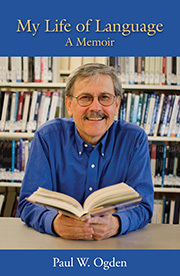 Paul W. Ogden is Professor Emeritus of Deaf Studies at California State University, Fresno.